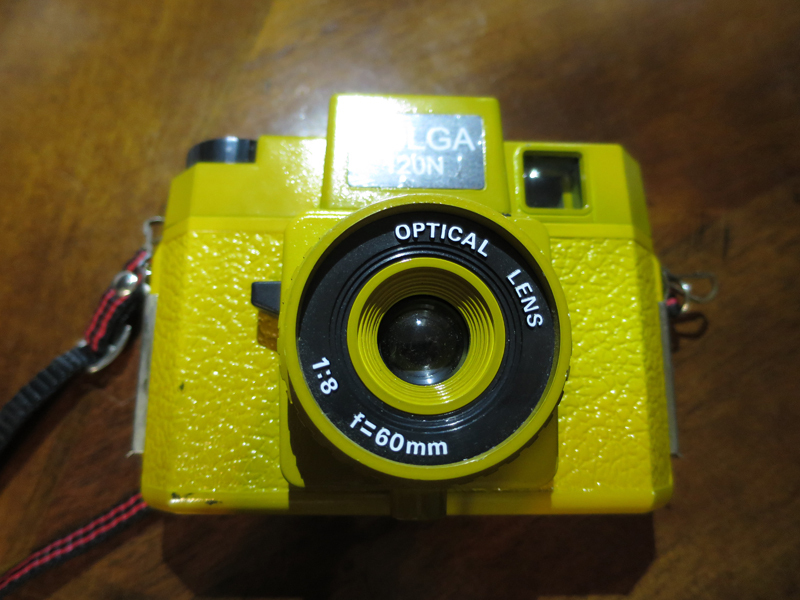 You’ve gotten yourself a Holga 120 film Camera. Maybe this is your first film camera, or maybe it’s just your first 120 medium format film camera. Either way, it’s time to learn how to load it. First, practice opening and closing your Holga without any film in it. This is something you’ll want to learn how to do well. Once you’re sure you can get the back of the camera on and off smoothly, you can move on to the film part. You don’t have to do this in pitch darkness, but it’s also good to at least do it in a shadow. I’ve done this in a variety of situations. I’ve done it while walking down a sunny path staying with a group. Just make sure you tuck the Holga in against yourself so your body casts a shadow, and move quickly so as little light as possible gets near the film. OK, so the film comes hopefully in a sealed outer container to keep it protected from light. The first step is to open that foil container and take the 120 film out. Your 120 roll of film should now have a paper strip around it to keep it sealed. Gently pull that off so the film is now loose. Unroll the film a little bit. There should be a narrower end on the right – this is going to go into the slot on the empty spool on the right side of your camera. Lay the film into the left hand side so it unwinds counter-clockwise across the back of your camera. You should have an empty spool on the right hand side. Tuck that narrow end into the slot of the spool. Holding it down with your left hand, slowly wind the top right knob counter-clockwise until the film fully catches against that spool. Seal up the camera back. Now take a look at the film window on the back of the camera. You should start to see arrows appear as you continue to wind. Wind slowly. Eventually you will get to the number one. That is when you stop! You are now ready to take your first photo. Make sure you tape over the window at this point so light doesn’t get in through it. You can temporarily uncover it each time you need to wind to the next frame. Good luck, and ask with any questions!